Home » How to Pay College Tuition » Student Loan Interest Rates Doubled! Are You Ready? Student Loan Interest Rates Doubled! Are You Ready? By now you have likely heard that last Friday, Congress failed to pass an extension which would keep student loan interest rates low. Because of this failure, yesterday, Stafford Subsidized student loans doubled in interest rate from 3.4% to 6.8%! Yes, these are the loans that are made available to students who come from low to middle income families and also qualify for the Federal Pell Grant. Yes, these are need based loans that just received a doubling of their interest rates. Both isles of Congress seem fairly set on passing legislation that will reduce these interest rates back to their former levels, but for now, the infighting has prevented any actual measures being passed. Until Congress takes action and changes this interest rate back, any new Stafford loan disbursements made after July 1, 2013 will be under the new interest rate increase. The good news is that if Congress does pass this measure, it would be retroactive in time for the upcoming Fall 2013 semester. So please let your Congressman know how much you would like the interest rates to stay at 3.4%. Unfortunately, if you are in a situation where you need to take out student loans, there is really nothing that you can do. Stafford subsidized and unsubsidized loans are the most competitive interest rate student loans available, and their repayment options are by far the most flexible of any loan type you will find. If you need a student loan, this is still your best choice for a loan. You can however, try to guard yourself from having to take out student loans at all. You should always max out any “free” financial aid before you consider student loans as an option. Many financial aid award packages automatically bundle student loans in with your financial aid award, but you do not have to be so quick to borrow. You can maximize your scholarships searching by checking out the free listings at your local library, your high school guidance counselor, your department at college, or your professors. These resources are often excellent resources for scholarships, that not many other folks think to explore. You could also consider becoming an entrepreneur and starting your own business to pay your way through college. You could buy and sell used textbooks, you could start a furniture moving company moving stuff into and out of dorm rooms, you could start a computer repair service on campus, you could start a mobile coffee cart business, or you could freelance write online for some extra cash. All of these methods will earn you money which you can then use to pay your tuition outright. In my mind, there is not much more satisfying than working hard and paying cash for something you are passionate about. Paying your own way through college also makes you appreciate what you are paying for and will likely help you be more invested in your education. You will also pick up some very valuable business skills, and develop an entrepreneurial mindset that will benefit you throughout your entire life. I don’t have any opinion on what the interest rate should be, but I think it’s unfortunate that the government creates so much uncertainty. It would be nice if they could make decisions far enough ahead of time so that people could actually make plans. All of this bickering and the uncertainy it creates is a drain on everyone. I agree! Not to mention the strain on colleges and universities that have to adjust on the fly as changes happen within the federal system. Every time a law changes the ripple effect if enormous. That is true. 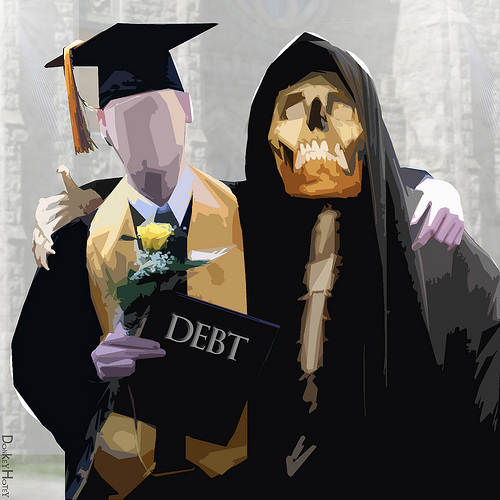 Wealth could certainly take away the need for student loans, but I think most of us will be touched by them at multiple points in our lives and it is fairly unavoidable. True, but wouldn’t we want it to stay at a lower level since the work had been done to keep them low for so many years? It can be so stressful, but being aware of it is half the battle so we can plan. That is true. And especially with the subsidized Stafford loans, the interest still does not begin to accrue until after graduation any way.